Mitchelton-SCOTT riders Simon Yates and Annemiek van Vleuten were presented as men’s and women’s WorldTour winners at UCI Gala Awards Dinner on Sunday. The duo, who won Mitchelton-SCOTT’s first Grand Tours this season – Van Vleuten the Giro Rosa and Yates the Vuelta a Espana – along with 16 other WorldTour victories between them, were awarded as the Individual UCI WorldTour Classification Winners at the UCI Gala Dinner in China today. For Simon Yates, the season was confirmation of his ability to win Grand Tours. A different season plan and debut at the Giro d’Italia seemed to bode well for Yates in 2018. After stage wins and second and fourth overall at Paris-Nice and Volta Ciclista a Catalunya in the lead up, the 26-year-old was primed for the first Grand Tour of the season (Giro) and an aggressive approach by the British rider and his Mitchelton-SCOTT teammates saw him win three stages during a 13-day stint in the Maglia Rosa jersey. Back in action after a rest period, Yates finished second at Prueba Villafranca-Ordiziako Klasika before claiming another stage and second overall at the Tour de Pologne. 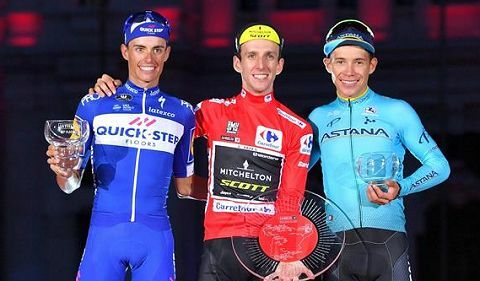 Despite a more ‘conservative’ approach for his second Grand Tour of the season, La Vuelta a Espana, Yates still managed to take a stage victory and spend 10 days in the jersey – all on the way to claiming his first Grand Tour general classification victory and the first for an Australian men’s team.